The N1 South-Bound will be closed to motorists on Sunday until Monday and motorists are advised to make use of alternative routes. 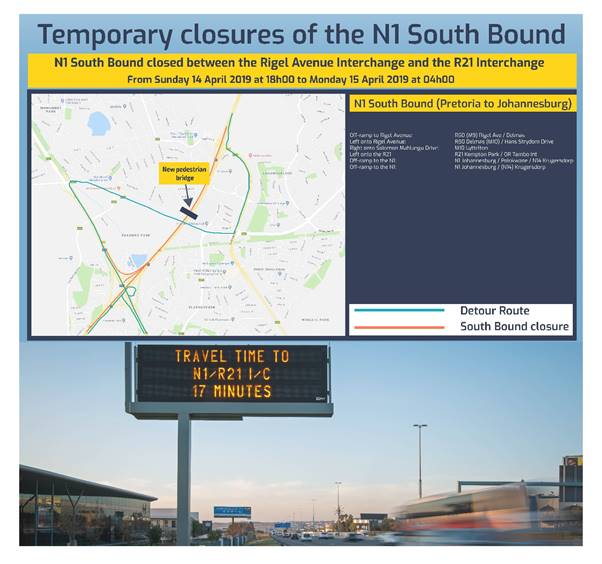 The South African National Roads Agency (SOC) Limited (SANRAL) would like to notify travelers that the N1 South-bound is scheduled to be closed from Sunday, 14 April 2019 at 18h00 until 04h00 on Monday, 14 April 2019 for the erection of a new pedestrian bridge at Erasmusrand. The road will be closed between the Rigel Avenue and R21 interchanges. This bridge is to replace the Bridge that was demolished in 2016. Travelers are advised to make use of alternative routes during these times. Off-ramp at and turn left onto Rigel Avenue towards Delmas (R50). Turn right onto Solomon Mahlangu Drive (M10). “We encourage road users to plan their trips ahead of time and to practice caution as they make use of the detours during this time,” said Progress Hlahla, SANRAL’s Northern Region Manager. SANRAL apologises for any inconvenience caused during the erection of this bridge.